Nick J. Sciullo, PhD, is an assistant professor of communications at Texas A&M University, Kingsville. He has been published in dozens of peer reviewed journals and law reviews on issues of rhetoric, race, class, and law. He has also spoken on hip-hop across the United States and Western Europe. Sciullo, Nick. Communicating Hip-Hop: How Hip-Hop Culture Shapes Popular Culture. Praeger, 2018. ABC-CLIO, publisher.abc-clio.com/9781440842238. 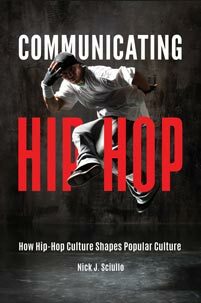 This insightful analysis of the broad impact of hip-hop on popular culture examines the circulation of hip-hop through media, academia, business, law, and consumer culture to explain how hip-hop influences thought and action through our societal institutions.